It’s August and daylight is on the wane. The sun is coming up later and setting earlier. We are beginning to see a cool night make an appearance on occasion. And many baseball and softball seasons have wrapped up for the year. There will be some fall ball seasons played but football season will take the lead by the end of the month. That means many ball fields are done for the season so it’s time to get to it and get those fields ready for next spring. Previously we talked about getting the grass back into shape after the season as well as dealing with any lip issues that may have developed during the season. Now, we move to the infield skin itself. This time of year is the best time to do any renovation on the infield skin whether it is minor or major. You have plenty of time to work on it without the threat of an opening day deadline and still plenty of favorable weather and soil moisture conditions. A season can take a toll on an infield resulting in ragged turf edges and high and low spots in the infield skin. Reestablish your turf edges by running string lines and scribing arcs to mark out where you need the turf edges trimmed back to in order to give the field some crisp, clean edges. If you find that trimming your baselines or infield edges are making those skinned areas too large, you may have to consider placing a strip of new sod in along the edges in order to reduce the width of the baselines or the size of the infield. This is usually inevitable over time where cool season grasses are grown. Southern grasses will grow much more aggressively into the skin areas and therefore trimming edges is a more frequent task where they are grown. 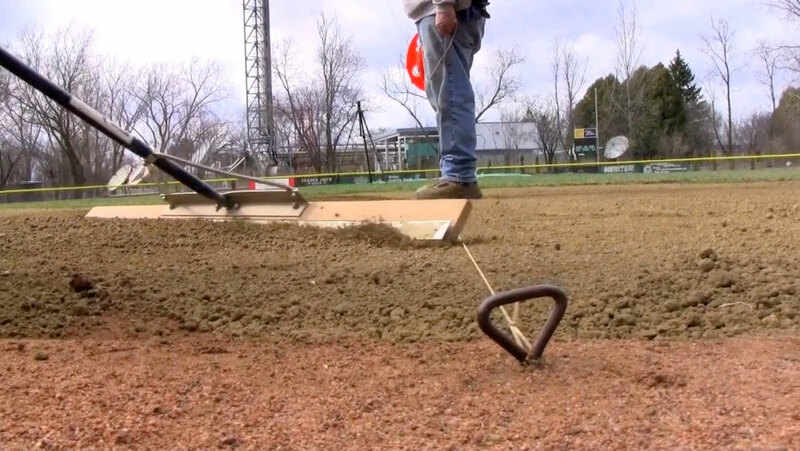 With the lips removed from your field and crisp clean edges reestablished, you can now use a string line to evaluate the condition of the surface grade of your infield skin. By stretching a string line from the front turf edge to the back turf edge of an infield, we can instantly see the condition of the surface grade of the infield skin. High spots will push the string up while low areas will leave a gap between the string line and the infield soil surface. When checking the grade, make sure that the string line is pulled as tightly as possible otherwise the line may sag providing incorrect readings of the surface grade. Take a survey of the infield by running string lines in several locations around the skin to check for the amount and magnitude of high and low areas on the skin. In general, high areas will typically occur on the first and third base corners of a baseball infield skin as well as along the back edge along the back arc. Low areas will commonly occur in leadoff areas around bases, fielder’s positions and the front edges of the infield skin. It is important to rectify these issues as soon as possible as these imperfections in the surface grade of your skin areas can create major headaches in rainy weather when you are trying to drain the field. IF you are lucky, you have the budget to call in a sports field contractor to repair the surface grade and improve its performance. If not, this work can be done on a low budget basis by doing it the old fashioned way, by running string lines and using your nail drag, rakes and level boards to manipulate the surface by cutting the highs and filling the lows to achieve a smooth and consistent surface grade. 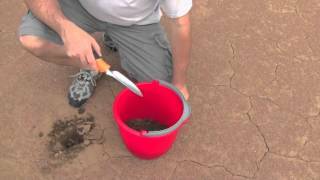 If you have historically had problems with the performance of your infield soil, an Infield Soil Test can be performed to look at the physical makeup of your soil. A test will expose any weaknesses in the make-up of your infield soil — Beacon can provide this service to you, contact us for more info. 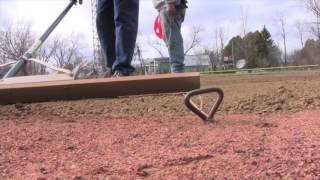 With the innovation of DuraEdge™ and FieldSaver™ “engineered infield soils” in the past decade, it has become easier and financially effective to fix most problem infield soils without pulling out the old soil in most cases. The late summer and fall season is a great time to make adjustments to your infield soil using these materials. A balanced infield soil and the perfect grade will provide you the ultimate playing surface. Finally, I’d like to mention a common question we get here at Beacon. Customers will often call to ask me how to keep weeds out of their infields and warning tracks. You can spray Roundup (Glyphosate) or other non-selective herbicides onto these areas but more than likely the weeds will return. The best way to prevent weeds on an infield skin or warning track is to continue maintaining the surface by dragging it about twice a week. This should be done throughout the remainder of the growing season. It will also keep the field smooth for surface drainage. There really is no other magic way of suppressing those persistent weeds.